A local photographer has captured a bird’s eye view of Wirral, England, after a suspected gas explosion flattened a dance studio and row of commercial properties in the borough. 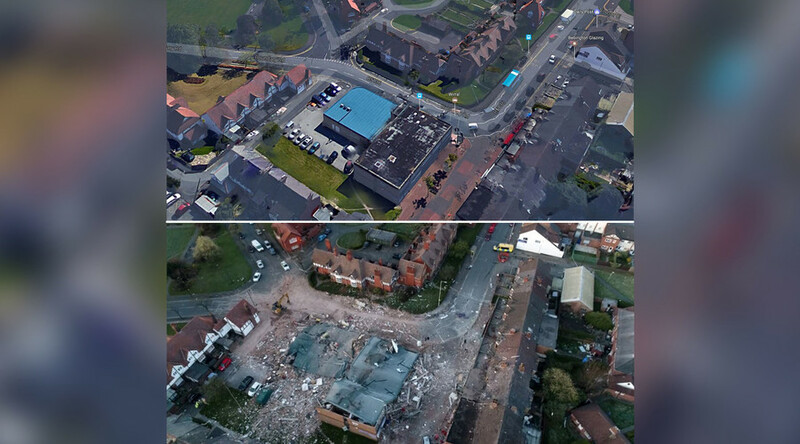 Drone footage from a Wirral-based cameraman, who goes by the name Pixels In The Sky, reveals large scale devastation around Boundary Road and Circular Drive, New Ferry after the explosion on Saturday night. Footage from the scene shows the collapsed remains of the Complete Works dance studios with debris strewn across a residential block. Significant damage was also inflicted on surrounding buildings, as the blast sent missiles of brick and wood flying towards the facades of nearby properties. According to Wirral Council, at least 30 people were injured in the blast, which destroyed “several buildings” at around 9pm on Saturday. “It sort of happened in slow motion. The curtains just lifted up and then the windows and the doors came in... [There was] debris everywhere. Basically we had to evacuate the house and it was just like a warzone outside,” Lennon said. Think this one image says it all. In the wake of the explosion, Labour MP Alison McGovern thanked the emergency services as well as Life Church, which gave shelter to a number of evacuees. “The consequences of this event are devastating,” McGovern added in a statement. “The buildings affected are central to the shopping area in New Ferry. I will be working with Cllr Phil Davies, leader of Wirral Council, and local ward councillors to understand how the community can move forward from this terrible blast,” the MP said.